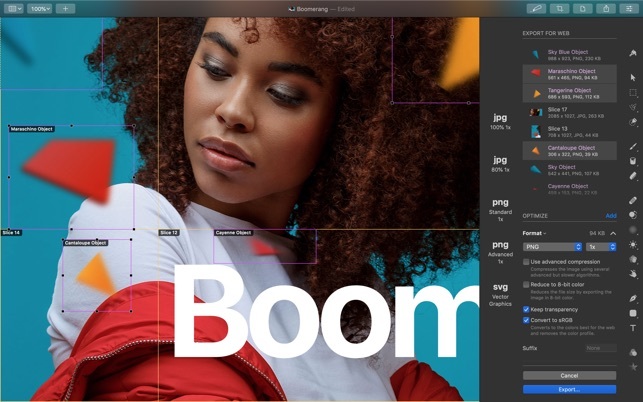 [prMac.com] Vilnius, Lithuania - The Pixelmator Team today released Pixelmator Pro 1.3 Prism, a major update to the award-winning Mac image editor designed to make powerful professional tools accessible to everyday users. The update introduces a range of great new features - such as layer color tags, filtering and search, clipping masks, and quick opacity and blending controls - that make creating advanced illustrations and designs easier than ever before. "We created Pixelmator Pro with the goal of making the most powerful professional image editing tools accessible to pros and beginner users alike," said Saulius Dailide, one of the founders of the Pixelmator Team. "And this major update brings a number of handy new features that make creating advanced illustrations and designs easier than ever, whether you're a long-time pro or a first-time user." Thanks to a number of brand new layer organization features, Pixelmator Pro is now even better suited to creating complex designs and intricate, multi-layered illustrations and artworks. Color tags give users more flexibility to organize designs by tagging important or related layers. Layer filtering makes it possible to temporarily filter out layers from the layer list according to layer type or color tag. And the new search feature gives users an instant way to find any object, even in the most layer-rich compositions. This update also brings clipping masks, allowing users to clip the contents of one layer to the outline of another. This is an essential tool for many digital artists and designers, and makes it possible to create perfect masks using existing objects in a design. What's more, in Pixelmator Pro, clipping masks can be created from any layer at all - whether it's an image, some text, a layer group, or even a nested shape, allowing unrivaled levels of flexibility. Pixelmator Pro 1.3 Prism, the third major Pixelmator Pro update since the app was released just over a year ago, includes a range of additional improvements, such as a more nondestructive editing workflow and improved support for exporting Photoshop documents, as well as other fixes to keep the app running smoothly.